It is a very common situation that you may find yourself against a problem dealing with deletion of dublicate records in a database table. This is a real problem if the records are identical even for values in each column. So you can not distinguish one row from the other. This problem may occur on any table if the table does not have a unique index or an identity column. Unique indexes guarantees that columns within the index has no dublicate values so each row in the table has also no dublicates. 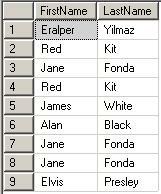 Identity columns are columns whose numeric values are generated automatically in a sequential way. So in a way using identity columns will also provide a uniqueness among the rows of a table as well as in the identity column values. But now we will deal with a situation where we can not avoid dublicate records in a table and try to remove or delete the dublicate rows from the database table. Before I explain both methods, it is better to create a table that will help us simulate the problem. You will notice that in our sample database table some records have been repeated two times, three times and even four times. Now we aim to get rid of the dublicate rows in the Users table. This will delete all the rows that have firstname value as Elvis and lastname equal to Presley which means all of the four records will be deleted. SET ROWCOUNT limits the sql server engine to process a specific number of rows. So the process stops after the defined number of rows are reached. The default value for ROWCOUNT is 0 which means no limit on the returning result set so all rows are returned. After a ROWCOUNT command is run and all processes are completed, you can also set the ROWCOUNT to 0 to turn off this option. After running the above DELETE FROM command with SET ROWCOUNT statement, the last status of the table Users as below. We are successfull to delete the identical rows with the row number 9 in the above picture. If you want to delete the identical records automatically we can use a cursor. It is important that while you are declaring the cursor for dublicate rows, you should select the count of identical rows minus one, since we want one of the dublicated records exist in the table after delete processes. You should also pay attention to the SET ROWCOUNT commands around the DELETE FROM command in the body of the cursor. A second method we can use while removing dublicate records from Users table is using the TOP expression in DELETE statement. With the release of SQL Server 2005, as an T-SQL enhancement TOP expression now takes a variable where else in SQL Server 2000 TOP was expecting a constant numeric value. This is very useful since if we decide to use a cursor, etc to delete all dublicates once, we may use a variable with the TOP expression. If you have not used the (n) syntax, you shoul get the following error; don't worry, just use the paranthesis. Using SET ROWCOUNT will not affect DELETE, INSERT, and UPDATE statements in the next release of SQL Server. Avoid using SET ROWCOUNT with DELETE, INSERT, and UPDATE statements in new development work, and plan to modify applications that currently use it. We recommend that DELETE, INSERT, and UPDATE statements that currently are using SET ROWCOUNT be rewritten to useTOP. 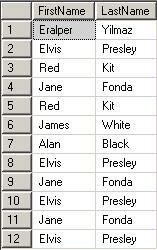 A third method can be adding an identity column to the table in order to distinguish all rows from each other. Of course, if you do not have the permissions to alter the table in order to add a new column, this method can not be implemented. Run the below sql command to add a new column to the Users table, which will also fill the newly added column Id with integer values in sequential order and will distinguish each record from its identical ones. And now let's look how we can automatically delete dublicates in this situation. We can use a Common Table Expression (CTE) to make a change and use a CTE instead of using a cursor. Here is the CTE (common table expression) sample that will delete the dublicates in our Users table. It is important to note that CTEs (Common Table Expressions) are also new enhancements in t-sql with the new release of SQL Server, SQL Server 2005. So the above sql statement will not run on SQL Server 2000 databases. For more samples and definition on CTEs you can read the article titled Common Table Expression. I guess, you have now a few techniques that you can use while dealing with dublicate records or rows in your sql server databases. If you have rows that differ from each other, you can use an other method to delete duplicate rows in a table. For example if you have inserted date column and you want to keep the first rows inserted into the table by ordering due to the insert date column, you can use the ROW_NUMBER() OVER (PARTITION BY ... ORDER BY ...) method. You can find an other tutorial titled Use ROW_NUMBER() OVER (PARTITION BY ... ORDER BY ...) to Delete Duplicate Rows in SQL Table among Kodyaz SQL articles for developers.